It may have been five years since the team at Panic released the last major version of their popular Transmit FTP client, but they’ve hardly been sitting around twiddling their thumbs. In the newly-released Transmit 4, they’ve made one of the best Mac file-transfer programs even better, adding new features, a redesigned interface, and performance gains that might make you wonder if the program’s venerable truck icon should be recast as a speedy little sports car. Transmit 4 features a new interface, including a Places feature that puts your most common locations in one easy-to-access menu. Every inch of Transmit has gotten some amount of love and care from the developers. Outwardly, there’s a brand new interface with tear-off tabs, Cover Flow and thumbnail views, Quick Look support, and a new Places feature that gives you one-click access to your most-used folders. There’s even a brand new Transmit Disk menu bar icon that lets you mount your favorite remote volumes on your desktop without even launching Transmit itself. Burrow down underneath the slick exterior and you’ll find the precision-machined underbelly, including the new Twin-Turbo Engine that provides the app’s impressive performance gains, including 25x faster speeds for uploading batches of small files and 18x faster for downloading batches of small files. 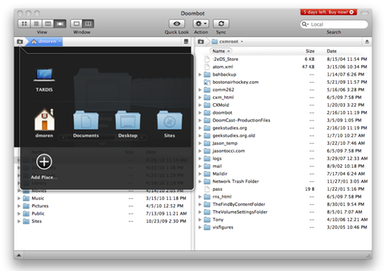 The new Transmit Disk feature lets you mount frequently-used volumes in the Finder. Despite a friendlier-than-ever interface, there’s no shortage of tools for power users in Transmit 4. You can now set smart rules for which files to skip while doing batch transfers, tweak advanced server preferences, and even issue SSH commands right from Transmit itself. There’s much, much more in Transmit 4, including multi-touch gesture navigation, bandwidth limiting, multi-connection transfers, full 64-bit support, and auto-update via the Sparkle framework. You can put the trial version through the paces—should you decide to take the plunge, the cost will be $34 (or $19 for owners of Transmit 3). 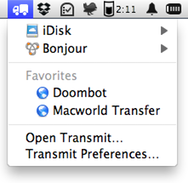 Transmit 4 requries Mac OS X 10.5 or later.